Gunner Architect | Arsenal Blogger. Will be keeping tabs of Ref's from the 2011-2012 season. United / Chelsea beware! Arsenal Blogger. Will be keeping tabs of Ref's from the 2011-2012 season. United / Chelsea beware! 6 in 1 Fixture List for 2013-2014 feat Arsenal, Manchester United, Chelsea, Manchester City, Tottenham Hotspur & Liverpool. Right now things are going smoothly as RVP is fit and scoring nonstop this year. But what about Chamakh and Park? They just can’t get a start. 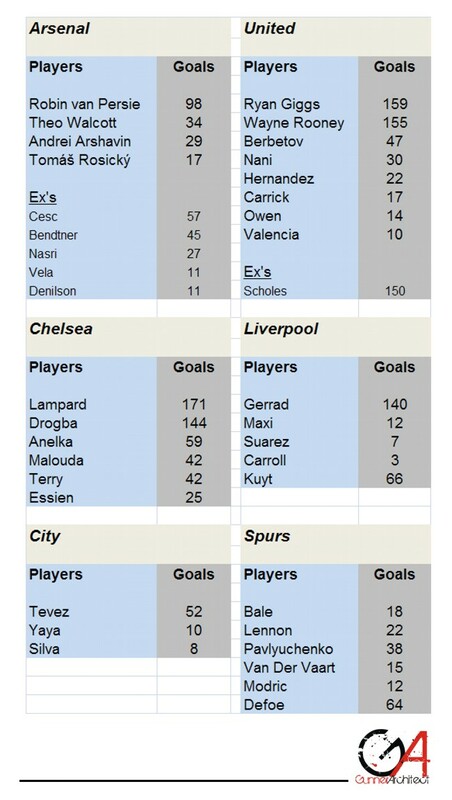 The media buzz is that we should buy a striker as good as RVP. Which we should. But will he start ahead of RVP? That is why there is a problem with our formation. I have no problem with the 4-3-3 formation but the ‘modern football striker’ has a problem with that. The modern football striker always needs game. He is hungry for starts. Which is how it should be. 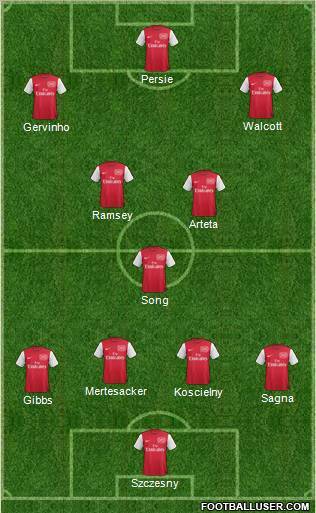 With our case we allow only one striker on top. 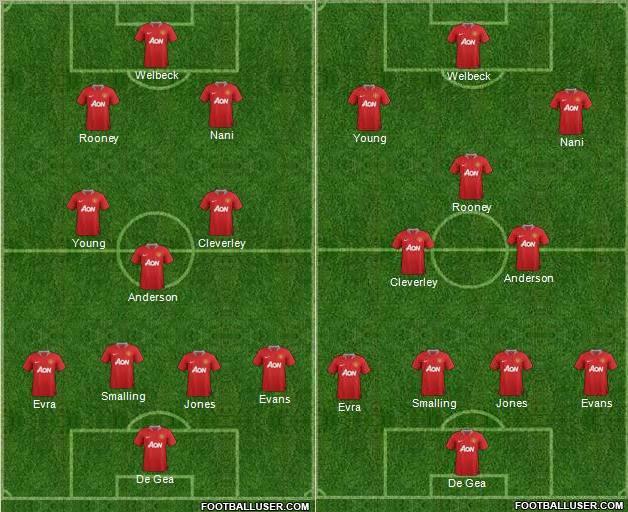 So comparing our formation with Manchester United’s… Our 4-3-3 vs 4-4-2. Now my point is that what United are actually doing is that this is not really a 4-4-2 formation; it’s more like 4-2-2-2 formation. 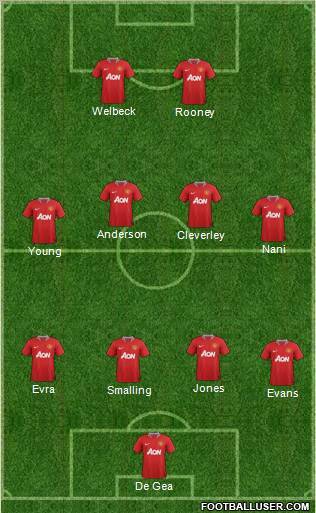 Young and Nani are wingers like how we have Gervinho and Theo. 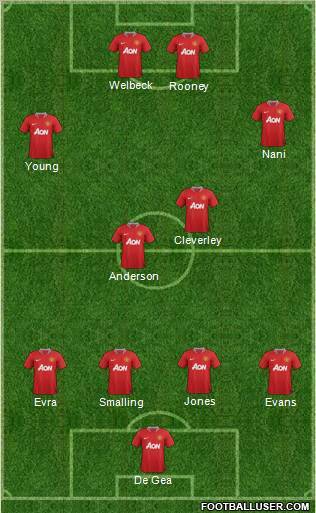 But the advantage that United have is that maybe the Wingers United have are better defensively in the midfield area? Valencia, Young, Nani play as wingers but then get back into the midfield. This gives United the advantage of playing 2 strikers upfront. This season United have successfully played Welbeck, Rooney, Hernandez in a lot of games, thus keeping the modern striker ‘happy’ by giving games. With such flexibility United try a number of formations. They can shift to a 4-3-3 formation but still play 2 strikes. What also works with playing 2 strikers is that they all get games. They can built on having some form and match fitness. With 2 strikers you could rotate positions. With the Arsenal wingers is there a problem that they are too attack minded? Theo has said he wants to become a striker. And gradually he is making the progress. 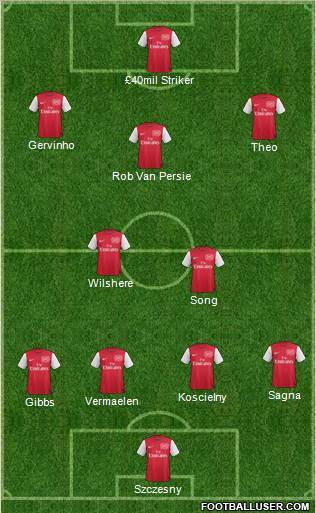 We could see and we do see this sometimes when Theo joins RVP on the top. If all 3 on top attack the way we attack, means we play with 3 strikers! 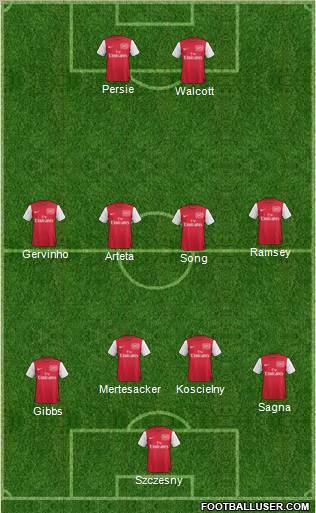 It could work but what happens to Chamakh and Park and the 4th amazing striker which we need. Chamakh and Park don’t have the pace to play as winger-strikers? Is it time for change in formation to keep players happy? I totally understand why Bendtner had to go. With his lack of pace he could not play the Theo role of fast winger-striker. What will make Chamakh and Park stay longer at Arsenal when they can’t get games. With them getting no games they also don’t get any match fitness, which means they can’t work on getting form. What if we buy a big 30-40mil striker. Where does he play? If he has any chance to play he needs to be quick like Gervinho, Theo & Arshavin so he could play that role, but as an out and out striker. An out and out striker will never be happy playing backup striker role to the main striker. Chamakh and Park maybe don’t have the confidence to demand that role. Bendtner lacked the skill maybe but he was desperate to start every game. He is getting that now at Sunderland. Any striker with the level of RVP that we seek will not be okay being on the bench. Right now its working for Arsenal as RVP is fit. But just playing nonstop he is bound to pick up minor muscular injuries. We will then have problem of having 2 strikers who have no form whatsoever. Maybe its time to play with 2 strikers where RVP can play in the behind the striker, linking up with Arteta or Ramsey or Wilshere. Wenger is not going to drop Song, our Defensive Midfielder. So could this be our future to make strikers happy and also keep them in form? 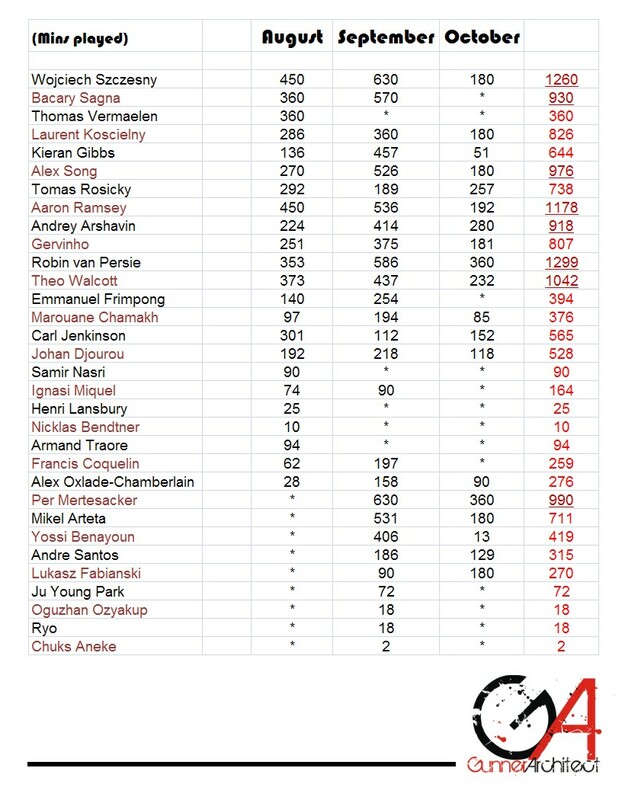 Most mins played so far is RVP with 1299 which is higher than our GK Szczesny’s 1260. He has been playing nonstop since the start of the season. Where he has played more is in the international ‘break’, which is not a break at all. If he continues playing weekend-midweek-weekend, he is going to get injured. We are heavily relying on RVP now, he needs to be used properly this season. Rotation is crucial, which we have not been doing. Chamakh and Park need games. They have hardly any match practice. If RVP gets injured, we will be in big trouble. 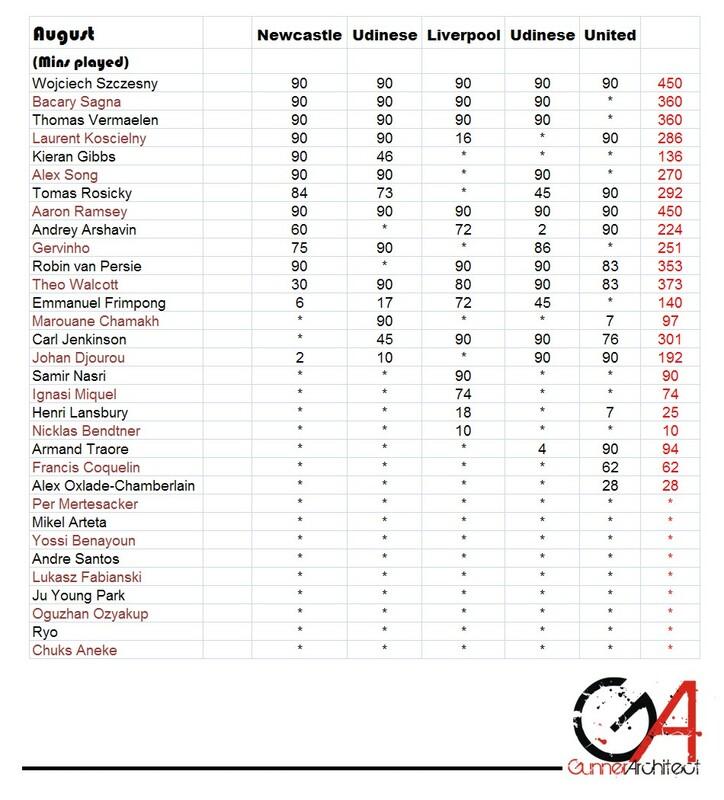 Mertesacker & Koscielny have been also playing a lot of games. All our new signings have played a lot since their arrival in September. Fabianski also needs game. He has played only one game for us. This is a copy my ‘source’ found at the desk of the famous commentators who comment during the Arsenal games. If you want to venture into the field of commentary, especially be an Arsenal game commentator, the following points are a must. – Mention Nasri and City, players who have left this summer. If you follow these above rules, Congrats! You are now an official Arsenal Commentator! They have been doing quite well because they have a very good marketing team and their revenue is really good. We were winning titles at Highbury but to compete with the mass appeal and the brand that is Manchester United all over the world, Arsenal needed the stadium. Alex ferguson manages the team very well and their football ‘luck’ is always with them, helping them win titles. They have been spending non stop since Roman arrived. They have spent £610mil more than us in the last 7 years! Our Emirate stadium took £400mil to built! Spent another £47mil this year on transfers. The introduction of the russian changed the game completely for Arsenal. He has been taking in huge loss since he came. But that’s how these billionaires work. September 2008, Sheikh Mansour takes over City and starts spending more than Chelsea! In just 3-4 years they have spent more than Arsenal. Which grows every year as we speak. Another £57mil spent this year, plus the ever growing wages which is very important in today’s game. They have spent £83mil more. No Champions League. No new Stadium. No titles like us in the last 5-6 years. Media says nothing to them. Free ride. They did remarkably well getting into the Champions League. But they found out its not easy to stay there. For the money they spent, they do a very good job. 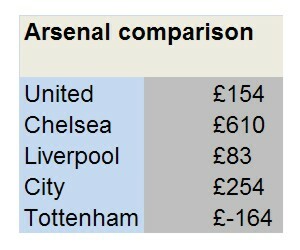 We have spent £164mil more than them if we combine the Wage and Net Spent. That is because they don’t pay high wages. But their net spent is the 3rd highest in the last decade. 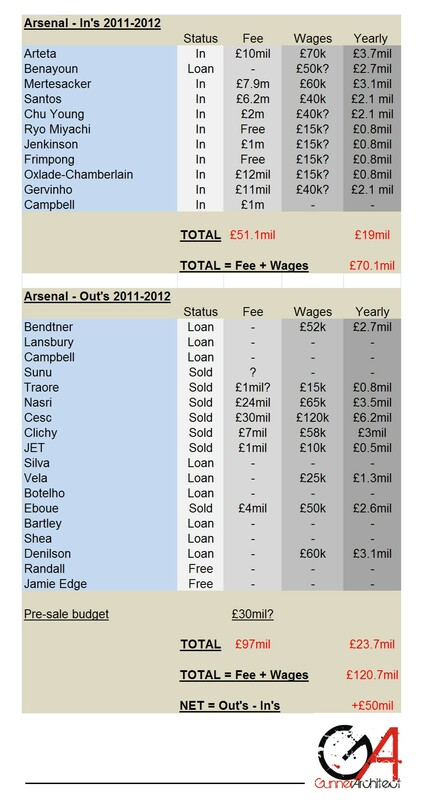 Many problems at Arsenal right now, but these financial reality should not be overlooked. We are not supposed to be competing for titles for the money we spend. But we do always, thanks to Arsene Wenger. 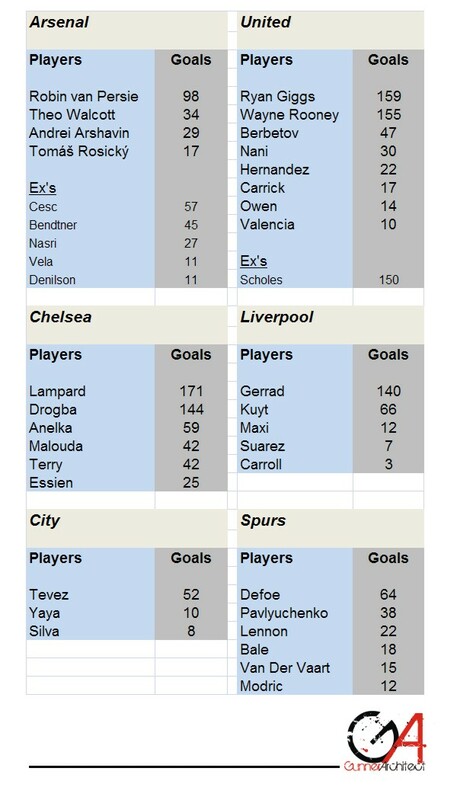 As we have sold a lot of players, its quite worrying that we have very few goal scorers in our team now. The same problem maybe there with Liverpool also. Don’t care about Spurs. City are a unique case, because new players are very good. New guys like Džeko, Agüero, etc are all world class and others are gelling in together very nicely this season, playing attractive goal scoring football! 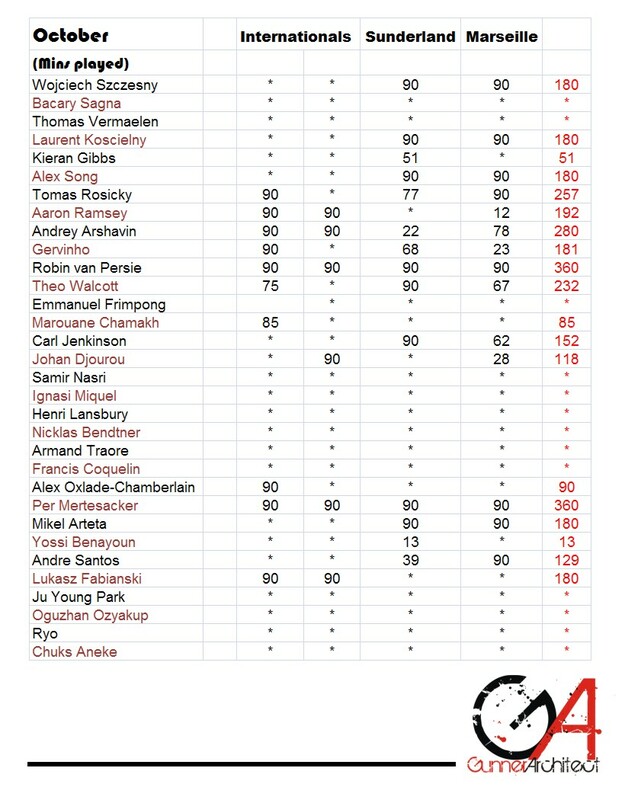 Arsenal’s record shows we have only managed to keep RVP who is the longest serving player now. When compared to United, Chelsea, its not a good record. United have really good players, who have been very faithful to their club and because of that, their record speaks for itself. More thoughts later… Bring on Blackburn! 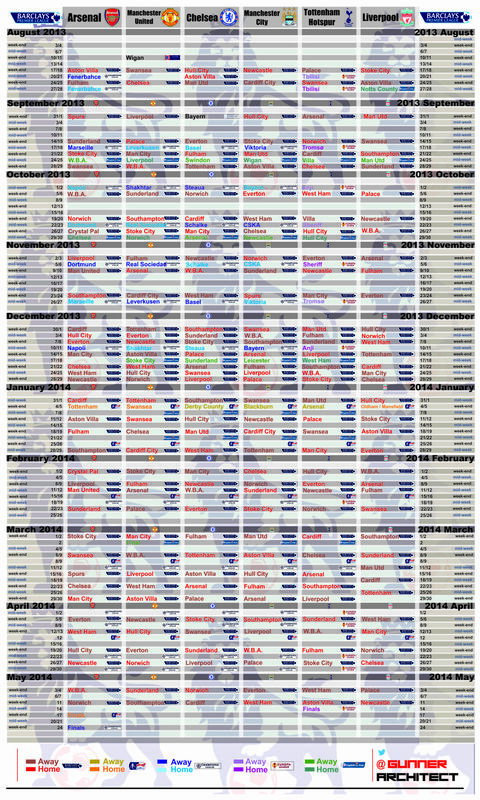 Check out the new Fixture List of all Top 6 Clubs together. *Forgot Diaby – 20 goals for Arsenal. 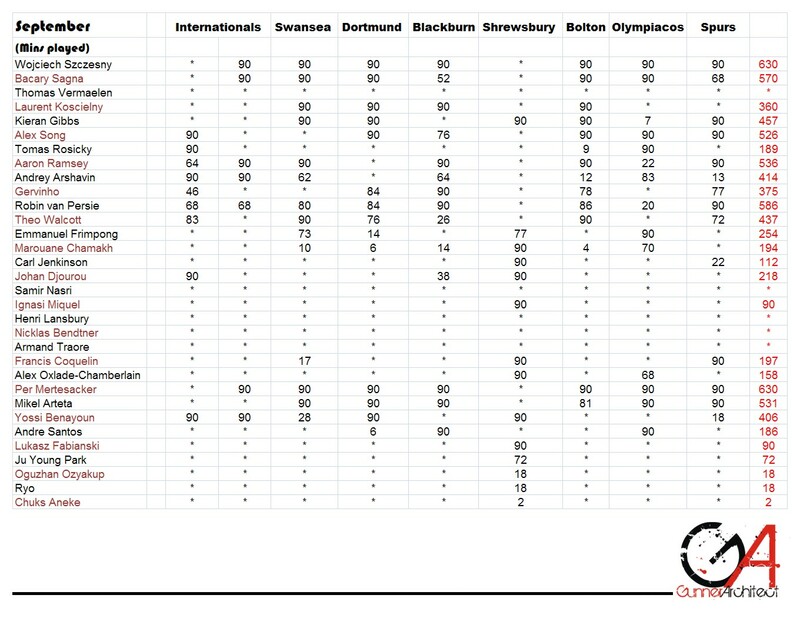 Click to Enlarge: *Please add / remove any changes for the figures above and do the maths accordingly if its wrong. This is just an estimate. So we have a Net Budget left of £+50mil still left to spend. I am glad we didn’t make any big name panic buys, and still we have not broken our transfer record of £15mil. But the main issue is that we have still not replaced Cesc. I have heard endless tweets saying he is one of a kind, etc etc. Sure. But we need to find someone matching his capabilities. Arteta is not that person. Sure he is adding depth, so is Yossi, but we have not got that quality player needed in the midfield who could provide those through balls for our 3 players up front. Jack Wilshere is good. But he is only 19. Whom is he gonna learn from? He is immensely talented but his combination with Cesc made us win many big games last year. Now we have to hope Arteta / Ramsey can form some partnership with Jack. Also hoping Jack gets fit soon. If we find this talented player we might bring him in January. We have £50mil to spend on him and his wages. We have got good experience at the back, but that Midfield position always worries me. We are gonna post record profits soon as we reduced a lot of wages, loaned a lot of players, etc. Before this season started with Cesc and Nasri we needed reinforcement. We had a chance to win the league with 9 games to go. But we didn’t. So we needed improvement. We sold them but haven’t got players of that quality. Let’s see how these new players perform. There is a reason why a player costs £10mil and £40mil. Wenger always says that don’t judge a player by his price tag, but with his quality and he has proved himself right a thousand times. But we are now talking about only one good player and that player needs to come soon in January or next summer window. It’s going to be fun watching football again after this horrendous summer window. Why we waited till the last day to make signings is totally beyond me. We knew Nasri wanted to go before Pre-season started. We knew Cesc wanted to go from last year. We could have easily purchased these players we have in June/July. Hopefully time will tell what happened in the back room of the emirates. Next up Swansea on the 10th of September. Watch out! Its going to be awesome!